When the air gets colder during winter is can cause the moisture inside your artificial turf infill to freeze which can have disastrous consequences if you don’t know what to do. In fact, these types of conditions are a safety concern since the surface is no longer as stable as it could be. The best thing that you can do if you discover that the low temperatures has caused your turf to freeze over is leave it to thaw naturally. In fact, this is the less risky and damage free solution to the problem however you have to remember that the weather must increase in temperature for this to occur. With this said, sometimes artificial turf can retain heat and lead to a faster thawing time. Of course, snow is a different issue overall and you have to be careful with your subsequent actions. If you want to remove the snow from the turf, then ensure that you shovel with care in the direction of the seams. Also make sure that you have an area to store the snow too. Underneath the snow layer however you may have a frozen turf like the one discussed above. 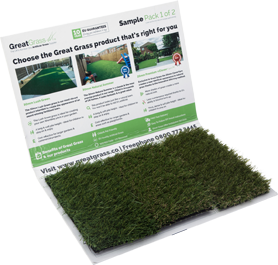 Here at Great Grass we like to think that we are one of the best artificial grass experts and we want nothing more than to share our knowledge and experience with our readers and customers. After all, what use is it inside our heads! For more information, speak to a member of the team today!